And he sounds fantastic! To my ear the song is reminiscent of a Broadway production (that’s not necessarily a bad thing) lots of passion. Apparently, Alan Parsons is into magic and said, “an album with magical influences was a natural progression”, There is reportedly a track featuring Jason Mraz as well. 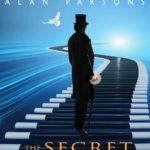 New Alan Parsons album “The Secret” hitting stores on April 26th.